These terms and conditions (the “Terms”) or (this “Agreement”) became effective beginning on December 15, 2014. The Business Care Plan Subscription Agreement Terms of Service (“Terms of Service” or “Terms”) set forth the terms and conditions under which TEKEASE ON-SITE, an Illinois limited liability located at 1915 W. Altorfer Drive, Peoria, IL 61615 (“TEKEASE,” “we,” “us,” the “company,” or “our”) will provide Client (“Client,” or “Clients”) with computer support services (collectively, the “service,” “Service,” “services,” or “Services”) as set forth in the particular service plan selected by the Client. These Terms apply to all subscription based business service Plan’s offered by TEKEASE to include the TEKEASE Business Primary Care™ Service Plan and the TEKEASE Business Essential Care™ Service Plan. (collectively, the “plan, “Plan,” “plans,” or “Plans”). These Terms explicitly do not apply to the TEKEASE Total Care™ Managed Services Agreement (“TCSA”) which has its own Terms of Service available at tekeaseonsite.com/business/mstos. These Terms, together with any other policies or guidelines referenced herein, constitute a binding Agreement between Client and Dr. Know Systems, LLC d.b.a. TEKEASE ON-SITE regarding Client’s access to and use of the Plan including all technical support, advice, servicing and software provided as part of the service. These Terms govern the Client’s purchase and use of the Service, whether provided through a telephone agent or via the Internet through the TEKEASE website located at tekeaseonsite.com (“Site”) or by an on-site TEKEASE Technician. By registering for or using the Service, Client agrees to these Terms. Client acknowledges that different Terms of Service apply to other services rendered by TEKEASE stores or from TEKEASE technicians/engineers who visit Client’s business. Business Care Plan refers to a line of technology services provided by TEKEASE. Please read these Terms of Service carefully before completing Client’s purchase of the Services. Acceptance of the Agreement by Client occurs when Client clicks the “SUBSCRIBE NOW” button on the Site, or by subscribing to the service in person at a TEKEASE store or with a TEKEASE technician. Upon receiving any of the Services, Client agrees to be bound by the terms and conditions set forth in these terms of service. We may modify these Terms of Service or any policy or other terms or obligations referenced in these Terms of Service (collectively, “Additional Policies”), at any time and without prior notice, by posting the revised version of these Terms of Service or such Additional Policies on our Site accessible at tekeaseonsite.com. Such changes will be effective upon the earlier to occur of (a) fifteen (15) days after posting or (b) if we provide a mechanism for Client’s immediate acceptance of the revised terms, such as a click-through confirmation or acceptance button, Client’s acceptance. Not limiting the foregoing, Client’s use of any of the Services following any such change constitutes Client’s agreement to be bound by the revised Terms of Service or any Additional Policies. It is Client’s responsibility to check the Site regularly for changes to these Terms of Service or the Additional Policies, as applicable. We last modified these Terms of Service on the date set forth at the top of this Agreement. The goal of the Service is to provide the Client certain technical support services in a TEKEASE location, remotely over the Internet and by phone (“Remote Services”) or on-site at the Client’s location. TEKEASE technicians (“Service Technicians will make reasonable attempts to assist Client with the software, hardware and network troubleshooting, installation, configuration, and set-up relating to technology matters that are specifically included in the Service the Client has subscribed to. TEKEASE will use commercially reasonably efforts to have its authorized TEKEASE retail stores and third party service providers (collectively, the “providers,” or “Service Providers”) provide the Services described in the Plan the Client selected solely for the desktop or laptop computer (“Computer”) identified at the time of purchase of Services. The Client consents to TEKEASE’s placement of an identification sticker on Client’s Computer in order to verify Client’s Computer’s eligibility to receive the Services. Client will not attempt to transfer, remove or alter this identification sticker. The Services are provided for Client’s personal use only. Client is not permitted to lease, sublicense, rent, transfer or otherwise offer or provide to third parties the Services Client receives under these Terms of Service. The Service does not include assistance with computer programming, software bug fixes of any kind or computer development support. The Service is not a hardware or software warranty or repair service. The plan does not extend any manufacturer warranty nor provide a warranty of any type to the Client on any hardware covered by the plan or software installed on the computer covered by the plan. The plan is not all inclusive. No parts are included in any TEKEASE service plan. The plan DOES NOT INCLUDE on-site services, pick-up or delivery services. The Client will bring the Client’s Computer to a participating TEKEASE location to receive Services. All Services will be provided during regular business hours, subject to availability and scheduling for the Services. Depending on the plan selected by the Client, certain services provided by TEKEASE under the plan may incur an additional fee. At all times TEKEASE will disclose the additional fee in advance of service being delivered to the Client. These fees will at all times be paid by the Client in advance of service provided. These one-time service (the “event”) are subject to the fees outlined on the TEKEASE site. The Client may request additional service related to the event at no additional charge during a period of seven (7) calendar days after service was originally delivered by TEKEASE. In this case, the additional service may only be for the same problem addressed and disclosed to TEKEASE when the initial service was provided. TEKEASE will not provide service under the (7) day period for ANY issue not disclosed to TEKASE at the time the original service. Client acknowledges that any symptom or issue not disclosed during the original time of service is not covered by the event service. Client further acknowledges that if the event reoccurs after the five (7) day event period, or if the Client caused the event to reoccur thru his or her own actions, as solely determined by TEKEASE, repair of such event will be on a paid basis and is not included under the one-time service or (7) day event period. Plan subscriptions (“subscription,” or “subscriptions”) include coverage for one (1) computer physically located at the client’s primary business address. Some plans may allow for up to (2) computers at no additional monthly charge. Plans provided by TEKEASE allow the Client to extend a subscription to cover additional computers physically located at the client’s primary business address at the add-on monthly rate of the subscribed plan. Additional computers are subject to an additional computer baseline service charge. Unless otherwise specifically stated, the minimum term for a Service Package subscription is one (1) year, and Client’s subscription, and this Agreement, will renew automatically on a month-to-month basis after the original term of Client’s subscription, unless Client give us prior written notice. The renewal price will continue to be the same as the pricing under Client’s expiring term subscription, unless otherwise specified in a written agreement or unless we notify Client in advance. TEKEASE ON-SITE Services are technical support services which may be provided, for an additional fee, at the Client primary service address. No on-site services are included as part of this agreement. Depending on the plan selected by the Client, plan may entitles Client to discounted on-site service at Client’s primary service address and may not be extended to any other location. Discounted on-site services are subject to the then current standard fee TEKEASE charges for delivery of such services. TEKEASE does not guarantee any results. If our Service Technicians are unable to assist Client with a particular request after making a reasonable effort to do so, Client will still be responsible for time spent in trying to assist Client. We will make reasonable efforts to respond to a service request within a reasonable time or within the response time described under an applicable Service, whichever occurs first, but we do not guarantee that a response will be provided within a specific time period. Specifically, although we will make reasonable efforts to accommodate Client’s service appointment needs and keep those service appointments, there is no guarantee that we will be able to do so. Client acknowledges the Service covers only support for the computer hardware, the computer operating system, software products manufactured by Microsoft or any software product purchased by the Client from TEKEASE. Client acknowledges TEKEASE only supports software products currently supported by the software manufacturer and TEKEASE support for software ends automatically coterminous with the support end date provided by the manufacturer. Data Backup Services. Clients who elect to obtain data backup Services from TEKEASE or from one of our Partner Providers “Partner” will receive services and a license to use software from the Partner subject to the Partner’s then current terms and conditions of use. Client agrees to be bound by the Partner’s current terms and conditions of service for data backup services in addition to the terms and conditions of services set out herein. The applicable prices for the TEKEASE service options are available on the Site (other than separate pricing for on-site technicians or enhanced off-site remote data back-up services). Service options may include one-time services. From time to time we may offer additional service and pricing options, some of which may be offered on a limited-time or trial basis. If any additional service or pricing options become available, Client’s purchase and use of the applicable services will be governed by these Terms. Unless otherwise expressly stated on the Site, any Service we provide is offered only in connection with the computer or computers Client has registered with us. Support for “peripherals” does not include support for smartphones unless otherwise expressly stated. In the event that we offer service options for smartphones, each service (and related pricing) option applies only to a single, registered smartphone. The following terms apply for all TEKEASE on-site services, except as noted otherwise under specific categories or service offerings. We may offer additional or different service options (including pricing options) in the future. If we do, the details of those service options, including their stated pricing, payment and durational terms, will automatically be incorporated into these Terms without the need for any action on Client’s or our part, and those service options will be governed by these Terms. Standard on-site services are available Monday thru Friday from 7 AM to 7 PM local time, excluding holidays. At the TEKEASE option, on-site service may be scheduled for Saturday from 7 AM to 7 PM, local time, excluding holidays. Appointments are generally available with 72 hours from time of scheduling. Services may not be scheduled by Client more than 14 calendar days in advance. Under normal conditions, Client should expect our technicians to arrive at Client’s premises within two (2) hours of the scheduled appointment time. Client must provide at least 24 hours advance notice of any cancellation or rescheduling request for Client’s appointment; otherwise, Client may be charged a $125 cancellation/rescheduling charge, at TEKEASE sole discretion. Rescheduling and cancellation, including refund of payment for unused service, are subject to the “Service Availability & Appointments” provisions, above. Service is available in all 50 states and Washington D.C., although not available in all parts of all states. Travel charges may apply depending upon Client’s service location, and may vary depending upon distance travelled and travel time of the service technician. However, if travel charges apply, Client will be advised of such charges prior to technician dispatch. If Client has questions about travel charges, Client should call (309) 689-8355 for specific details. TEKEASE reserves the right to change coverage and services offered at any time, and TEKEASE expressly reserves the right to deny service for any or no reason without liability or penalty, except as expressly stated in this Agreement. On-site service price is for one trip. All on-site service charges are flat rate or hourly as specified. Minimum charge for on-site service is one hour plus applicable trip charges. On-site service is charged in one-hour increments. The clock for the appointment time starts when the technician begins the technical service work, typically within 10 minutes of the technician arriving at Client’s location. TEKEASE technician must have (i) timely access to Client’s site and to the computer(s) peripheral(s) and/or routers to be serviced, (ii) consent and cooperation to enter site from Client or Client’s authorized representative, (iii) a safe working environment and work space, and (iv) electrical power. If the TEKEASE technician determines that these conditions have not been met, service may be denied; if service is denied, a $125 missed appointment/site not ready charge will be assessed. Client must ensure that the location at which TEKEASE provides Services is a suitable and safe working environment, free of Hazardous Materials. “Hazardous Materials” means any substance or material capable of posing an unreasonable risk to health, safety or property or whose use, transport, storage, handling, disposal, or release is regulated by any law related to pollution, protection of air, water, or soil, or health and safety. TEKEASE does not handle, remove or dispose of Hazardous Materials, and TEKEASE has no obligation to perform work at a location that is not a suitable and safe working environment. If TEKEASE encounters any Hazardous Materials at Client’s location, it may terminate or suspend Service, and Client may be assessed a $125 site not ready charge. TEKEASE will not be liable for any Hazardous Materials. For all on-site services, a person at least 18 years of age and authorized to sign the work order on Client’s behalf must be present during the entire time period services are provided. If no adult is present, services will be denied and a $125 missed appointment fee or cancellation charge will be assessed. TEKEASE technicians will not be held responsible for moving any equipment, furniture, valuables, or any other Client-owned items. TEKEASE technicians will not, under any circumstances, move, alter, or install electrical outlets. It is recommended to have necessary electrical work performed prior to any service; failure to do so may result in delays and additional charges. TEKEASE will not be responsible for damages resulting from any Client-provided parts (for example, cables, brackets, storage drives, memory cards, etc.). All labor purchased from TEKEASE will have a 7-day labor guarantee from the date of service. This guarantee is provided to the original purchaser and applies only to work performed at the original service event. Any modification of system, software, computer hardware, routers or other covered equipment will void this guarantee. The labor guarantee does not apply to water or physical damage, to electrical surges or damages from foreign objects (including, but limited to, insects or rodents). (i) Computer(s) must be in working condition and available on-site at time of installation service; (ii) Operating system(s) must be Microsoft Windows® Vista, Windows® 7, Windows® 8, Apple OS 10.3® (or higher) and all operating systems must be English versions only; (iii) Operating system and/or ISP passwords must be available; (iv) Operating system disks and key codes must be available; and (v) Software and peripheral hardware must be compatible with computer configuration. High-speed Internet access must be available for services requiring Internet access. Only owner-licensed software will be installed or re-installed by a TEKEASE technician. Specialty installations, including but not limited to enterprise software or hardware, structured cabling/wiring, or Client configurations, are excluded. It is Client’s responsibility to back up all software and data on Client’s computer’s hard drive(s) and/or any other storage devices prior to every appointment. TEKEASE and/or its third-party service provider shall not be responsible at any time for any loss, alteration, or corruption of any software, data, or files. TEKEASE can provide options for back up service at an additional charge. TEKEASE will make reasonable efforts to help recover Client’s data from any virus/worm or spyware/malware that may be evident on Client’s computer; however, it is Client’s responsibility to provide proper and updated protection from further contamination. On-Site Service as a follow-up to Remote Service: (i) Charges: Special rates apply to situations where after a remote technical session; our service technician determines that the problem cannot be resolved remotely and requires an on-site visit for further troubleshooting and fixing. For those cases, on-site support is available for a flat fee of $95 per hour. Client must provide at least (24) hours advance notice prior to cancellation of this follow-up On-Site Service; otherwise Client may be charged a $125 cancellation/rescheduling charge, at TEKEASE sole discretion. (ii) All other provisions relating to on-site service apply to this follow-up Onsite Service. Payment for Services Client agrees to provide TEKEASE with credit card payment information at the time of service scheduling. Client authorizes TEKEASE to charge the Client provided credit card for all services rendered by TEKEASE. In consideration for the Services, Client will pay us the applicable fees for Services in the amounts set forth on the respective Service detail pages on the Site (including any minimum subscription fees). Fees for any new Service or new Service feature will be effective upon posting by us on the Site for the applicable Service. We may increase or add new fees for any existing Service or Service feature, by giving Client 30 days’ advance notice. Such notice will be posted on the Site on the Service detail page for the affected Service. Client agrees they are fully responsible for checking the Site each month to confirm whether there are any new fees and their effective date(s). All fees payable by Client are exclusive of applicable taxes and duties, including, without limitation, and applicable sales tax. Charges for the Service may include subscription plan charges, activation fees, hourly charges, minimum service fees, no-show fees, failure to cancel fees, early termination fees, set-up fees and other non-recurring charges, and all applicable taxes. Upon request, TEKEASE can provide Client a statement itemizing the services and fees that correspond to the charges billed to Client’s account. Client must notify TEKEASE in writing if Client intend to discontinue the Service or change the credit card or telephone account to which Client’s Service charges are billed. TEKEASE is not responsible for any fees or charges that Client may incur as a result of charges posted to a closed credit card account or a discontinued credit card account number. Client acknowledges TEKEASE does not accept debit cards for payment of any charge or fee in connection with the Service. Client agrees that TEKEASE will charge the credit card Client provided for all fees and charges associated with the Service, and Client agrees to pay the applicable credit card charges according to the applicable account terms and conditions. Client authorize TEKEASE to automatically continue charging Client’s credit card (or any replacement credit card if the original card is renewed, lost, stolen or changed for any reason by the credit-issuing entity, and TEKEASE is informed by such entity or Client of a replacement account) for all fees and charges associated with Client’s use of the Service. TEKEASE reserves the right to decline to accept a credit card Client has provided, and may either request a different credit card for billing, or decline to complete Client’s order. Service to Client may be denied, suspended or discontinued without notice at any time if Client’s credit card is suspended, put on hold, or becomes inactive, or if the date on Client’s credit card expires and Client has not provided us with updated information for an active account prior to such expiration, or if Client’s credit card provider denies or discontinues providing payment to us, or if Client otherwise fail to make payment to us when due. TEKEASE may, at any time, with advance notice by email or other means of communication, change the amount of or basis for determining any fee or charge or institute new fees or charges for the Service. If fees are charged on an hourly basis, any estimate given to Client of the required service time is an estimate only and not a cap on the fees that will be actually incurred. All fees and charges are payable in accordance with pricing and billing terms in effect at the time the fee or charge becomes payable. All amounts are stated and payable in U.S. Dollars. If any portion of Client’s bill is not paid by the due date, TEKEASE may charge Client a late fee on unpaid balances and may also terminate or suspend Client’s Service without notice. The late fee will be the lesser of one and one half percent (1.5%) per month or the highest rate permitted by law. In the event TEKEASE utilizes a collection agency or resorts to legal action to recover monies due, Client agrees to reimburse us for all expenses incurred to recover such monies, including attorneys’ fees. TEKEASE reserves the right to charge service fees and other charges to a Client’s credit card, as applicable, up to eight (8) weeks after the end of the calendar month in which the corresponding service was concluded or the corresponding charge was incurred. We may specify the manner in which Client will pay any fees, and any such payment shall be subject to our general accounts receivable policies from time to time in effect. All amounts payable by Client under this Agreement will be made without setoff or counterclaim and without deduction or withholding. Representations. By subscribing to the Services, Client represents to us that (i) Client is at least eighteen (18) years of age; (ii) Client owns or has all rights and permissions necessary to obtain Services for the Computer Client has identified; (iii) Client has the right to enter into these Terms of Service and these Terms of Service do not conflict with any other agreement; and (iv) the information Client has provided during subscription (“Account Information”) is true, accurate, current and complete. During the term of these Terms of Service, Client will maintain and promptly update Client’s Account Information using the functionality provided through the Site or by emailing us at support@tekeaseonsite.com or by calling us at (309) 689-8355. By registering for the Service, Client agrees to allow our Service Technicians to use the tools they deem necessary or advisable to perform the Service, including obtaining remote access to Client’s computer and related network and peripherals during Client’s service session. If our Service Technicians advise Client to take such preliminary steps as buying cables or cords, acquiring software, etc., they will create and keep a ticket open for Client so that it can be referenced again when Client is ready to go to the next step. If Client cannot pursue the recommended course of action, our Service Technicians will consider the ticket closed. As it pertains to the Agreement, the term Client Business (the “Client Business,” or “Business”) refers only to Client, and the Client’s full-time or part-time employees who work at the Client’s primary business address. Authorized users must be specified by Client at the time of service contracting. The Service cannot be directly or indirectly resold, transferred to another party or otherwise made available by Client to others and they cannot be made available to anyone outside of the Business. Specifically, only Client and Client’s designated employees may access and use the Service. Minimum system requirements. TEKEASE reserves the right to refrain from providing any or all requested Services on the basis that minimum system requirements are not met, or if technical conditions or Client requirements are beyond the scope of Services as determined by TEKEASE or its third-party service provider. Technical limitations. Some Client’s may not be able to receive the Service if initial testing shows that their computer environment is not suitable for remote access. Further, our Service Technicians may not have access to the necessary proprietary information from vendors, manufacturers and developers necessary to assist with a specific technical matter. Our ability to provide assistance may also be limited by other matters outside of our control, such as software or hardware errors not yet resolved by the applicable hardware or software manufacturer. Maintenance. We may, at any time, without notice or liability, restrict or suspend the Service in order to perform maintenance activities and to maintain session control. Through our Service Technicians, we offer a personal service we believe can be a valuable resource for helping Client to address Client’s technical questions and difficulties. In providing that personal service, we require our Service Technicians to be courteous and respectful, and we expect the same of Client. We reserve the right to terminate a support session, this entire Agreement and or Client’s account as a result of offensive discourse or behavior. Client agrees to waive all rights to any refund if Client’s service is terminated by TEKEASE as the result of inappropriate conduct or offensive behavior. Client further agrees to pay the service cancellation fees due under the terms of this Agreement if it is terminated by TEKEASE as a result of offensive behavior or inappropriate conduct. TEKEASE or its affiliates may contract with one or more independent contractors (also referred to herein as “third-party service providers”) to provide some or all of the Service. Client acknowledges and consents to the provision of some or all of the Service by one or more independent contractors engaged by TEKEASE or its affiliates for such purposes. In this Agreement, references to “we”, “our Service Technicians”, the “Service”, and services provided by “us” or “TEKEASE”, refer both to TEKEASE and to such independent contractors and their technicians and the services provided by them under such engagements by TEKEASE or its affiliates. Software. In connection with the Service, one or more of our third-party service providers may provide to Client, via download, CD, other media, or other delivery method, the use of certain software which is owned or licensed by such third-party service provider, and which may be provided free or for a fee (“TEKEASE Software”). Client acknowledges and agrees that Client may be required to install and download TEKEASE Software pursuant to the terms and conditions of an end user license agreement in order to permit some or all of the Service to be provided to Client. TEKEASE Software is required for all Remote Services. From time to time, Client may be required to download and install updated or replacement TEKEASE Software to keep Client’s Service working properly. TEKEASE will notify Client of all such required updates and replacements, and Client agrees to perform the required download and installation or have them performed by our Service Technicians. Any failure to download and install TEKEASE Software when required (including any updates and replacements) may result in loss of data or other adverse consequences. Client understands and agrees that the Service does not include free upgrades of existing software, operating systems, or applications. Furthermore, use of this Service does not constitute a license to use software, applications or equipment from TEKEASE. TEKEASE does not provide any such upgrades or licenses through this Service. However, as part of the Service, Client may request our Service Technicians to assist Client to, or they may suggest that Client, acquire, install and use certain third-party software. All third-party software, including TEKEASE Software (collectively, “Third-Party Software”), whether or not required to permit some or all of the Service and whether or not suggested by our Service Technicians, is licensed to Client by the respective owners or licensees of the Third-Party Software. Client must agree to the terms and conditions set forth by such owners or licensees before installing Third-Party Software, regardless of whether our Service Technicians assist Client in the acquisition, installation, and/or use of Third-Party Software, because Client’s use of Third-Party Software is governed by the terms of the end user license agreement between Client and such owners or licensees. Please note that TEKEASE grants no rights to any Third-Party Software and does not make any representation or warranty regarding any Third-Party Software. Furthermore, please remember that it is Client’s responsibility to comply with the terms and conditions under which Client licensed such Third-Party Software. We make no warranty that we are an authorized service provider for any Third-Party Software or for any computer hardware or other equipment; it is Client’s sole responsibility to determine if Client require additional rights for us to provide technical support for any Third-Party Software or computer equipment and if so, to acquire such rights. Client understands and agrees that it is Client’s sole responsibility to back up and protect all data, software, information and other files stored in any manner on Client’s computer, peripherals, smartphone or other applicable hardware prior to a service appointment with a Service Technician. If our Service Technicians work with Client on any password or other access issues (in connection with support services or TEKEASE Rescue), we strongly recommend that Client reset such passwords(s) or access feature(s) immediately. TEKEASE and its third-party service providers shall not be responsible at any time for any security, loss, alteration, or corruption of any of Client’s software, systems, data, or files. Client acknowledges that the Internet is not a secure network and that third parties may be able to intercept, access, use, or corrupt the information Client transmit or receive over the Internet. Client also acknowledges that TEKEASE cannot and does not guarantee or warrant that data, software, or other electronic files that may be provided, suggested, accessed or otherwise available for download in connection with the Service will be free of defects, infection or viruses, worms, Trojan horses or other code that manifest contaminating, malicious or destructive properties. Client is solely responsible for acquiring and maintaining the Internet and telecommunications services and devices required to access and use the Service. The Service does not include Internet, telephone, wireless, wireline or other connectivity services. Client agrees that Client is responsible for all use on Client’s account, including any secondary accounts or sub-accounts associated with Client’s primary account. Client understands this means that Client accepts full liability and responsibility for the actions of anyone who uses the Service via Client’s account, or any secondary accounts or sub-accounts, with or without Client’s permission. Client also agrees that only Client and Client’s designated employees may access or use the Service for which Client is registered. Data Backup. Client is solely responsible for protection the files, data, programs and other information on Client’s Computer prior to providing Client’s Computer to TEKEASE for Services. Client represents that Client is and will remain a legal license holder or licensed user of the software on Client’s equipment. Client further represent that Client is and will be the owner or lessee of any hardware or network devices that Client may request our Service Technicians to assist Client with in association with the Service. Any individual who purchases the Service on that individual’s own behalf must be an adult of at least 18 years of age. By agreeing to these terms, Client agrees that these Terms constitute a valid and binding obligation on the user of the service. All references to “Client” and “Client’s” herein shall refer to the Business, as well as Client, individually. PLEASE NOTE THAT INDIRECT, ATTEMPTED, OR ACTUAL VIOLATIONS OF THESE TERMS, BY CLIENT OR ANY OTHER PERSON USING CLIENT’S USERNAME AND PASSWORD SHALL BE CONSIDERED VIOLATIONS OF THESE TERMS BY CLIENT. All information that Client provide in connection with the Service must be accurate, including Client’s name, address, credit or charge card numbers, expiration dates or any other required payment information. Client further represent that Client is authorized to pay charges using the credit card account at the billing address that Client provide for Service charges. Use of the Service is subject to TEKEASE Acceptable Use Policy, found at tekeaseonsite.com/tos, which is hereby incorporated herein by reference. Client agrees to abide by the Acceptable Use Policy in connection with the Service. Violations of the Acceptable Use Policy may result in termination of Client’s ability to use the Service, and may give rise to legal remedies and other adverse consequences to Client. TEKEASE and its third-party service providers may access, use, and disclose transaction information and any content provided by or concerning Client to comply with the law (e.g., a lawful subpoena) based on TEKEASE reasonable judgment that disclosure is legally required; to initiate, render, bill, and collect for the Service; to protect TEKEASE rights or property; or to protect users of TEKEASE services, the Site and other persons or entities from fraudulent, abusive, or unlawful use of the Site or any aspect of the Service. These Terms of Service will be effective when Client completes registration and will continue for one year. At the conclusion of Client’s Plan’s term, these Terms of Service will automatically renew on a month to month basis and Client will be charged the applicable monthly Fee for Client’s Plan until Client terminate these Terms of Service. This Agreement goes into effect upon Client registration or subscription for the Service and continues, subject to the terms of this Section, until (a) the completion of the one-time service Client has purchased, (b) termination of Client’s Service Package subscription, or (e) termination by either party as expressly permitted by this Agreement. Client may terminate a Service Package by writing to TEKEASE Rescue, 1915 W. Altorfer Drive, Peoria, IL 61615, or calling one of our representatives at (309) 689-8355 (the “Notice Methods”). If Client terminates a Service Package with a term commitment, Client will be charged an early termination fee equal to 50% of the monthly recurring rate for the terminated Service Package multiplied by the months remaining in the term. If service to Client is discontinued as set forth in the section entitled “Credit Card and Phone Account Billing”, such circumstance shall be deemed Client’s termination of the Service Package and the early termination fee shall apply. If Client’s Service Package term has expired and Client’s Service Package has become a month-to-month subscription, Client may terminate that subscription by providing us with 30 days prior notice using one of the Notice Methods, with such termination to take effect at the next end of the billing cycle after 30 days have elapsed from the date we receive Client’s notice. Client understands and agrees that any software that Client acquire and install as part of a Service Package subscription plan may cease to operate, update or function properly after termination of the subscription plan, and that Client’s rights to use such software pursuant to the applicable end user license agreement may cease or become limited after such termination. TEKEASE may in its discretion terminate or suspend Client’s Service without notice if: (i) TEKEASE believes that Client has breached any of the terms or conditions (including, but not limited to, representations, warranties and fair and acceptable use provisions) of this Agreement or any license for TEKEASE Software or Third-Party Software; (ii) TEKEASE believes Client’s use of the Service may be prohibited by law or may be disruptive to or adversely impact the Service, TEKEASE or its affiliates or third-party service providers’ networks, or their use and enjoyment by other users; (iii) TEKEASE or its third-party service providers become involved in any dispute concerning control of Client’s Service account, or TEKEASE or its third-party service providers receive an order from a court or government agency to terminate Client’s Service; (iv) TEKEASE for any reason ceases to offer the Service generally, or to offer the Service in Client’s geographic area; (v) TEKEASE believes that Client is abusing the Service or using the Service excessively; or (vi) there is reason to believe that Client or someone using Client’s account has been accessing or attempting to access restricted information or files to which Client or someone using Client’s account does not have legitimate access. Changes to Services and Plans; Termination by TEKEASE. TEKEASE has the right to supplement, change, or cancel any Plans and the Services provided under these Terms of Service at any time, with or without cause, after giving 15 days’ notice to Client. If TEKEASE terminates or cancels a Plan during the initial term of Client’s subscription and Client do not elect to subscribe to an alternate Plan, then TEKEASE will refund the pro-rata amount of the Fees Client paid for the Plan for the remaining term of the Plan. TEKEASE also has the right to terminate these Terms of Service and Client’s right to receive Services immediately for any or no reason including if Client breach or violate any term or provision in these Terms of Service. In the event TEKEASE terminates these Terms of Service as a result of Client’s breach, then Client will not receive a pro-rata refund of Fees. CLIENT’S PURCHASE AND USE OF THE SERVICE-WHICH INCLUDES THE MONITORING, MAINTEANANCE, MANAGEMENT, SUPPORT, ADVICE, SERVICING AND SOFTWARE PROVIDED BY OUR SERVICE TECHNICIANS OR AUTOMATED TOOLS, ALONG WITH THE SITE-IS AT CLIENT’S OWN RISK. TEKEASE MAKES NO WARRANTY THAT (i) THE SERVICE WILL MEET CLIENT’S NEEDS OR REQUIREMENTS; (ii) CLIENT’S ACCESS TO THE SERVICE WILL BE UNINTERRUPTED, TIMELY, SECURE OR ERROR-FREE; (iii) THE RESULTS THAT MAY BE OBTAINED FROM THE USE OF THE SERVICE WILL BE ACCURATE OR RELIABLE; (iv) THE QUALITY OF ANY PRODUCTS, SERVICES OR INFORMATION PURCHASED OR OBTAINED BY CLIENT THROUGH THE SERVICE WILL MEET CLIENT’S EXPECTATIONS; (v) THE OPERATION OR FUNCTIONALITY OF THE SERVICE WILL BE FREE OF DEFECTS, OR THAT ANY SUCH DEFECTS WILL BE CORRECTED; OR (v) ANY RESPONSE TIMES OR APPOINTMENT TIMES WILL BE MET BY TEKEASE OR ITS SERVICE PROVIDERS. TEKEASE DOES NOT WARRANT THAT THE SITE, SERVICES OR ANY SOFTWARE WILL OPERATE ERROR-FREE OR THAT THE SITE, SERVICES, OR THE SERVERS USED BY THE SITE ARE FREE OF COMPUTER VIRUSES AND OTHER HARMFUL MATERIAL. IF CLIENT’S USE OF THE SERVICE RESULTS IN THE NEED FOR SERVICING OR REPLACING EQUIPMENT OR DATA, TEKEASE IS NOT RESPONSIBLE FOR THOSE COSTS. NO ADVICE, STATEMENT, OR INFORMATION, WHETHER ORAL OR WRITTEN, OBTAINED BY CLIENT FROM ANY SERVICE TECHNICIAN OR OTHERWISE IN CONNECTION WITH THE SERVICE WILL CREATE ANY WARRANTY NOT EXPRESSLY STATED IN THESE TERMS. EXCEPT AS MAY OTHERWISE BE SPECIFICALLY PROVIDED IN THESE TERMS, ALL ASPECTS OF THE SERVICE ARE MADE AVAILABLE AND PROVIDED “AS IS” AND “AS AVAILABLE,” AND ALL WARRANTIES, EXPRESS OR IMPLIED, ARE DISCLAIMED, INCLUDING, BUT NOT LIMITED TO, ANY IMPLIED WARRANTIES OF MERCHANTABILITY, QUIET ENJOYMENT, NON-INFRINGEMENT, TITLE, AND FITNESS FOR A PARTICULAR PURPOSE. FURTHER, TEKEASE MAKES NO REPRESENTATION OR WARRANTY THAT TRANSMISSIONS WILL BE ERROR-FREE OR WITHOUT INTERRUPTION, OR ANY GAURANTEE REGARDING NETWROK SECURITY, THE ENCRYPTION EMPLOYED BY ANY SERVICE, THE INTEGRITY OF ANY DATA THAT IS SENT,BACKED UP, STORED OR SUBJECT TO LOAD BALANCING, OR THAT TEKEASE’S SECURITY PROCEDURES WILL PREVENT THE LOSS OR ALTERATION OF, OR IMPROPER ACCESS TO, CUSTOMERS DATA AND CONFIDENTIAL INFORMATION. THE SERVICE PROVIDERS AND ANY MANUFACTURES OF EQUIPMENT THAT THE SERVICE PROVIDERS INSTALL IN CLIENT’S COMPUTER MAY PROVIDE VARIOUS WARRANTIES AND IMPOSE OBLIGATIONS ON CLIENT IN THEIR TERMS AND CONDITIONS. ALL SUCH WARRANTIES ARE LIMITED TO THEIR EXPRESS TERMS AND WILL BE PROVIDED EXCLUSIVELY BY THE SERVICE PROVIDER WITHOUT RECOURSE TO TEKEASE. 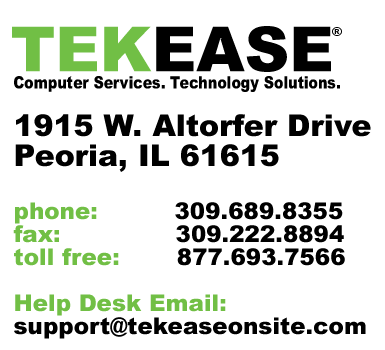 TEKEASE PROVIDES ALL SERVICES, EQUIPMENT AND SOFTWARE ON AN “AS IS” AND “AS AVAILABLE” BASIS. TEKEASE EXPRESSLY DISCLAIMS ALL WARRANTIES OF ANY KIND, WHETHER EXPRESS OR IMPLIED, WITH RESPECT TO THE SERVICES, EQUIPMENT AND SOFTWARE INCLUDING, BUT NOT LIMITED TO, THE IMPLIED WARRANTIES OF MERCHANTABILITY, FITNESS FOR A PARTICULAR PURPOSE AND NON-INFRINGEMENT. TEKEASE MAKES NO WARRANTY THAT THE SERVICES WILL MEET CLIENT’S REQUIREMENTS. NO ADVICE OR INFORMATION, WHETHER ORAL OR WRITTEN, OBTAINED BY CLIENT FROM TEKEASE OR SERVICE PROVIDERS WILL CREATE ANY WARRANTY NOT EXPRESSLY STATED IN THESE TERMS OF SERVICE. The limitations of damages set forth above are fundamental elements of the bargain between TEKEASE and Client. We would not be able to provide the Services to Client without such limitations. Application of Terms to Third-Party Service. All limitations, disclaimers and rights stated anywhere in these Terms for the benefit of TEKEASE also apply to its affiliates’ third-party service providers, licensors and other direct and indirect third-party service providers as third-party beneficiaries of this Agreement, without prejudice to any limitations, disclaimers and rights stated in any license or other agreement entered into between Client and such third parties in connection with Client’s use of the Service. TEKEASE and its third-party service providers shall retain all title, ownership rights, and intellectual property rights in and to the Services. The Services are protected by patent, copyright and other intellectual property laws. Client agrees not to take any action to jeopardize, limit, or interfere in any manner with TEKEASE (or its third-party service providers’) ownership of or rights with respect to the Services. Except for the rights specifically granted to Client in the Terms, all rights in and to the Services are reserved, and no implied licenses are granted by TEKEASE. If our ability to render the Service is impaired by circumstances (including without limitation strikes or labor actions) beyond the reasonable control of TEKEASE or its affiliates, or their direct or indirect suppliers or third-party service providers, we may choose not to provide some or all of the Service. CLIENT AGREES TO INDEMNIFY, DEFEND, HOLD HARMLESS AND RELEASE TEKEASE, ITS PARENT, AFFILIATES AND SUBSIDIARIES AND THEIR RESPECTIVE DIRECTORS, OFFICERS, EMPLOYEES AND AGENTS, FROM AND AGAINST ANY AND ALL LOSSES, LIABILITIES, CLAIMS, DAMAGES, COSTS AND EXPENSES, INCLUDING REASONABLE ATTORNEY’S FEES, OF ANY NATURE ARISING IN ANY WAY FROM OR RELATING TO, DIRECTLY OR INDIRECTLY, (1) THE SERVICE, (2) CONTROL OVER AND USE OF CLIENT’S ACCOUNT BY ANY PARTICULAR INDIVIDUAL(S), (3) ANY BREACH OF THESE TERMS OR THE TERMS OF ANY LICENSE AGREEMENT, (4) THE STORAGE OR PROCESSING OF CLIENT’S FILES, (5) RESPONSES TO LITIGATION HOLD REQUESTS AND GOVERNMENT PROCESS CONCERNING CLIENT’S FILES, AND (5) ANY CLAIM OF MISAPPROPRIATION OR INFRINGEMENT OF A THIRD-PARTY’S INTELLECTUAL PROPERTY RIGHTS, IN THE CASE OF EACH OF THE FOREGOING CLAUSES (1) THROUGH (6) INCLUDING WITHOUT LIMITATION LOSSES, LIABILITIES, CLAIMS, DAMAGES, COSTS AND EXPENSES ARISING IN WHOLE OR IN PART FROM THE NEGLIGENCE (WHETHER SOLE, JOINT, OR CONCURRENT) OF TEKEASE OR ITS AFFILIATES, AND THEIR LICENSORS, DIRECT AND INDIRECT SUPPLIERS, AND THIRD-PARTY SERVICE PROVIDERS. Client acknowledges that services and software (including, but not limited to, technical assistance) provided in connection with the Service may be subject to import, export, or data transfer laws, conventions or regulations, and any use or transfer of the software, personal data, or technical information must be in compliance with all such laws, conventions and regulations. Client will not use the Service to distribute, transfer, or transmit any software, personal data, or technical information except in compliance with such laws, conventions and regulations. None of the TEKEASE Software or any underlying information or technology included in the Service may be downloaded or otherwise exported or re-exported (a) into (or to a national or resident of) any country to which the United States has embargoed goods; or (b) to anyone on the U.S. Treasury Department’s list of Specially Designated Nationals or the U.S. Commerce Department’s Table of Deny Orders. These Terms and the relationship between Client and TEKEASE will be governed by the laws of the State of Illinois, without regard to its conflict of law provisions. Client agrees to submit to the personal jurisdiction of the state and federal courts located in Illinois, and waive any objections thereto. Client further agree that any dispute arising from or related to Client’s use of the Service must be brought exclusively in the state or federal courts located in Peoria County, Illinois, unless a Illinois mandatory venue statute applies to the dispute, in which case the Illinois County of mandatory venue shall be the exclusive jurisdiction for such dispute. Notice. We may provide notice to Client by posting on the Site, or sending Client notices via e-mail or regular mail. Assignment. Client may not assign, delegate or otherwise transfer Client’s Account or Client’s obligations under these Terms of Service. TEKEASE will have the right, in its sole discretion, transfer or assign all or any part of its rights under these Terms of Service and will have the right to delegate or use third party contractors to fulfill its duties and obligations under these Terms of Service. Severability. If any clause or provision in these Terms of Service is held by a court of competent jurisdiction to be invalid in whole or in part, then the remaining clauses and provisions, or portions thereof, will nevertheless be and remain in full force and effect, and the parties will substitute for the invalid provision a valid and binding provision resembling the invalid provision as closely as possible in intent and economic effect. Captions. The captions of each section are added as a matter of convenience only and will be considered of no effect in the construction of any provision of these Terms of Service. Attorneys’ fees. If any party hereto will bring any suit or action against another for relief, declaratory or otherwise, arising out of these Terms of Service, the prevailing party will have and recover against the other party, in addition to all court costs and disbursements, such sum as the court may adjudge to be reasonable attorneys’ fees. Survival. The Disclaimer of Warranties, Indemnification and Limitation of Liability sections of these Terms of Service will survive the termination of these Terms of Service. Waiver. Failure to insist upon strict compliance with any of the terms, covenants and conditions hereof will not be deemed a waiver of such terms, covenants and conditions, nor will any waiver or relinquishment of any right or power hereunder at any one or more times be deemed a waiver or relinquishment of such right or power at any other time or times. No waiver will be valid unless in writing and signed by an authorized officer of TEKEASE. Limitation on Actions. Regardless of any statute or law to the contrary, any claim or cause of action arising out of or related to use of the Sites or the Terms of Service must be filed within one (1) year after such claim or cause of action arose or be forever barred. TEKEASE and Client agree to exercise best efforts to resolve all disputes and claims between us through good faith negotiation. TEKEASE and Client further agree that any such dispute or claim that cannot be resolved by negotiations shall be resolved by binding arbitration administered by the American Arbitration Association (”AAA”) under its Commercial Arbitration Rules in effect at the time the dispute is submitted for resolution (the ”Rules”), as may be modified by this Agreement. This agreement to arbitrate is intended to be broadly interpreted. Judgment on the award rendered by the arbitrator(s) may be entered in any court having proper jurisdiction. Such arbitration shall be held in the State in which the Services are billed. In the event Client is billed by TEKEASE for Services in of multiple states, such arbitration shall be held in the State of Client’s primary service address. Within twenty (20) days of the issuance of a written notice to arbitrate by one party to the other, as provided by the Rules, the parties shall jointly select one (1) independent arbitrator licensed to practice law. If we cannot jointly agree on an arbitrator within the specified 20-day period, then the selection shall promptly be made by the AAA in accordance with the Rules and the criteria set forth above. The arbitrator may award injunctive relief only in favor of the individual party seeking relief and only to the extent necessary to provide relief warranted by that party’s individual claim; furthermore, unless Client and TEKEASE agree otherwise, the arbitrator may not consolidate more than one person’s claims, and may not otherwise preside over any form of a representative or collective proceeding. If this specific provision is found to be unenforceable, then the arbitration provision shall be null and void. CLIENT AGREES THAT, BY ENTERING INTO THIS ARBITRATION AGREEMENT, CLIENT AND TEKEASE ARE EACH WAIVING THE RIGHT TO A TRIAL BY JURY OR TO PARTICIPATE IN A CLASS ACTION. TEKEASE AND CLIENT AGREE THAT EACH MAY BRING CLAIMS AGAINST THE OTHER ONLY IN AN INDIVIDUAL CAPACITY AND NOT AS A PLAINTIFF OR CLASS MEMBER IN ANY PURPORTED CLASS OR REPRESENTATIVE PROCEEDING. These Terms, and any other policies or guidelines referenced herein, constitute the entire agreement between TEKEASE and Client in connection with the Service. These Terms supersede any prior or contemporaneous written or oral communications, proposals, representations and agreements between Client and TEKEASE with respect to the subject matter of these Terms. If any provision of these Terms is found by a court of competent jurisdiction to be invalid, the parties nevertheless agree that the court should endeavor to give effect to the parties’ intentions as reflected in the provision, and the other provisions of these Terms shall remain in full force and effect. Client agrees that regardless of any statute or law to the contrary, any claim or cause of action arising out of or related to use of the Service, Client’s account with respect to the Service, or these Terms must be filed within one (1) year after such claim or cause of action arose or be forever barred (unless such limitation is contrary to the public policy of a particular state, in which case the applicable limitations period shall be the shortest limitation period permissible under that state’s law). The failure of TEKEASE to exercise or enforce any right or provision of these Terms will not constitute a waiver of such right or provision. If Client violate any of these Terms, TEKEASE may in its sole discretion terminate or suspend Client’s access and use of the Service immediately without notice. Client agrees that TEKEASE shall not be liable to Client or any third-party for any termination of Client’s access to the Service. TEKEASE may, but Client may not, assign rights or obligations under the contract embodied by these Terms. Subsidiaries and affiliates of TEKEASE provide products and services under the TEKEASE brand. TEKEASE, the TEKEASE logo and all other TEKEASE marks contained herein are trademarks of TEKEASE Intellectual Property and/or TEKEASE affiliated companies. All other trademarks are the property of their respective owners.